Whilst both the Leave and Remain campaigns officially suspended campaigning yesterday following the murder of Labour MP, Jo Cox, some remain campaigners have been using her death as a campaign tool. 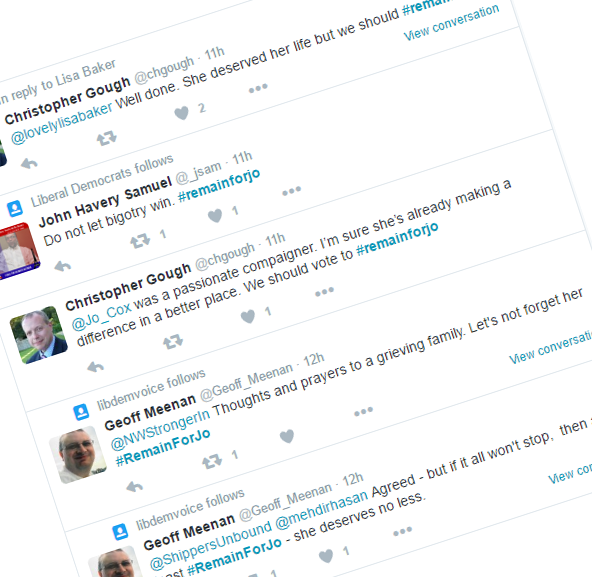 Remain campaigners have been trying (unsuccessfully) to get the #remainforjo hashtag trending on Twitter. One Remain campaigner near Upholland posted a picture of a Leave sign that he had demolished saying that he was so upset at Jo Cox's death that he "couldn't walk on by" without causing some criminal damage. 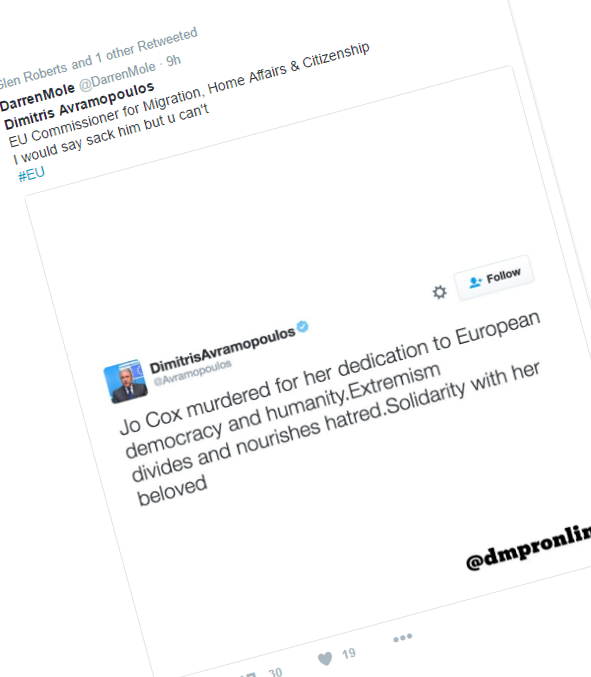 The EU Commissioner for Immigration, Dimitris Avramopoulos, claimed that Jo Cox was murdered for her dedication to the EU then deleted the tweet. The tweet claiming that the alleged attacker shouted "Britain First" as he attacked the MP was deleted when witnesses denied that it had happened. 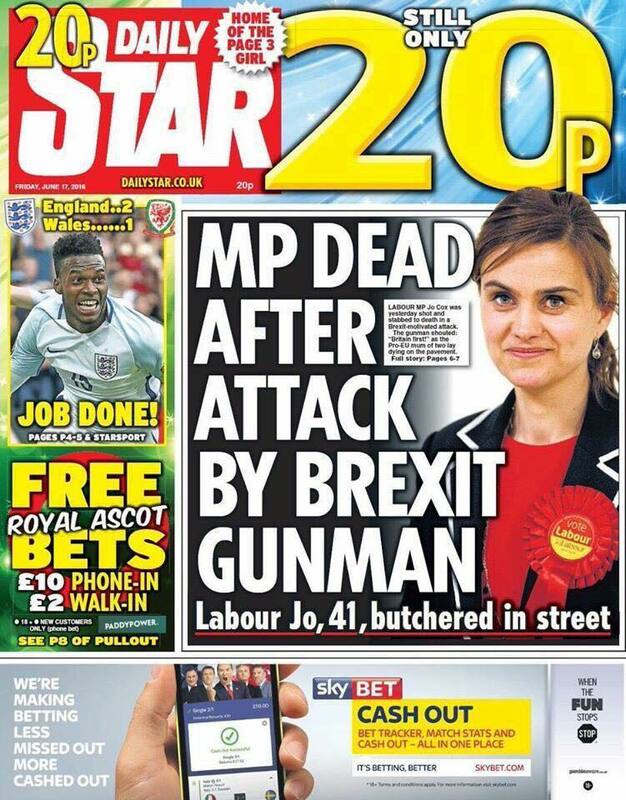 Hate not Hope and the Daily Star have concentrated on the false claim that the alleged attacker shouted "Britain First" as he attacked the MP and are trying to link the attack to the Leave campaign. Jo Cox was murdered by a mentally disturbed man who, it is believed, was on medication for a mental illness and had been having psychotherapy. She lost her life intervening in an argument in the street between her alleged murderer and another man. She wasn't murdered by a "far right activist" or a "Brexit gunman". 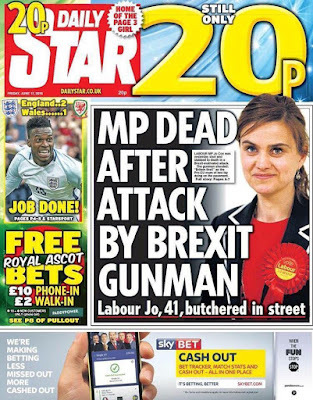 The Remain campaigners trying to make political capital out of the tragic death of a wife and mother of two young children should be ashamed and the Daily Star will find this their Sun Hillsborough moment.